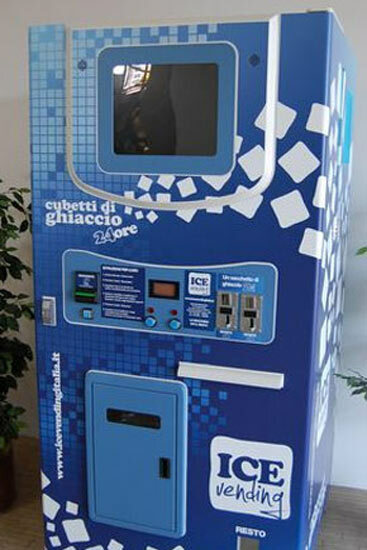 Gr Vending imports and distributes in Greece the ice cubes vending machines of the italian Ice Vending. 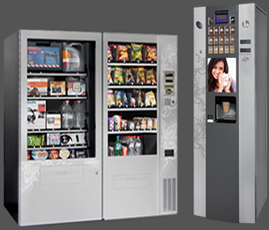 To view the features and specifications, please click on the vending machines titles below. Pre-paid cards (IC Card), Integrated 17’’ LCD Display, Water Recycling System, Water Vending System. Max Bin Storage 65 Kg. Power: 220-240 Volt @ 50 Hz and 60 Hz. Average Power Consumption: 1163 Watt. Semi-Automatic Bagging System, Coins Collector and Bill Validator, GSM Reporting System, Automatic Diagnosis Reporting System, Possibility to set sale price and quantity dispensed, Environment Protection Refrigerant, Bacteria Killing Light: Ultraviolet UV-C 253.7 nm wavelength, Certificate Water Filtration System (R.O), Modular design for easy maintenance, EC Certification, ISO 9001/2000 and ISO 14000. The shape of dice cubes provides maximum liquid displacement making this type of ice cube ideal for general purpose cooling of drinks. 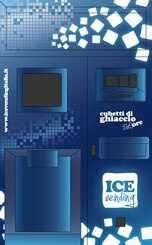 They can be made very quickly and are ideal for ice vending machines. Water is poured over the surface of the vertical evaporator grid plate with each cube forming in a cell on the grid. This is a cost-efficient system that let produce high volume and work properly even when water is rich of minerals. Pre-paid cards (IC Card), Integrated 17’’ LCD Display, Water Recycling System. Max Bin Storage: 250 Kg. Average Power Consumption: 3.5 Kw. Ice Type: Cube and Crushed. Dimensions: 113 cm (width) x 140 cm (depth) x 230 cm (height). Power 220-240 Volt @ 50 Hz e 60 Hz. Ice Type: Lunar (dim.40mm x 30mm x 20mm). Dimension: 450mm (Width) x 560mm (Depth) x 1780mm (Height). Coin acceptor without changer, Adjustable ice price and volume set by owner, Environment protection refrigerant, Modular Design, easy maintenance, CE, ISO 9001/2000 e ISO 14000.